Disaster risks will change over the coming decades. Some level of risk must be accepted, but we can do much more to manage that risk and to build resilience. Natural hazards have always been with us. A devastating earthquake in Lisbon in 1755 killed 30-40,000 alone. The 1918 ‘Spanish flu’ pandemic is estimated to have killed up to five percent of the world’s population, a number greater than both World Wars combined. The impact of such natural hazards does not stop at UK shores. The impact on UK GDP in 2008 monetary terms was an economic loss of £6.3 billion. A recent report from the Foresight programme suggests that everyone involved in disaster risk preparedness must play their full role in improving risk assessment. The Foresight Programme, brings together world-class experts from a wide range of scientific disciplines, including the social sciences. Foresight projects, which are developed over six months to two years, combine authoritative interpretation of scientific evidence with a forward look which can be up to 80 years into the future, depending on the topic. Key future trends and uncertainties, together with their policy implications, are highlighted for decision makers. The report underscores a warning from the UN Secretary- General, Ban Ki-moon, who said in May 2013: "Economic losses from disasters are out of control". Direct losses from disasters since 2000 have cost $2.5 trillion. This includes Hurricane Sandy in 2012, the Japanese earthquake and tsunami of 2011, and massive floods in Thailand in the same year. Sandy devastated parts of the West Indies and the entire US eastern seaboard from Florida to Maine. In the past 20 years more than 1.3 million people have been killed in disasters and the lives of many more blighted. Thankfully, such extreme natural disasters are rare in the UK. Yet our country remains vulnerable to other catastrophes, including extreme flooding. The UK government is already using state-of-the-art science and modelling to protect our citizens and infrastructure. Work on national resilience – the ability to prepare for, respond to, and recover from emergencies – led by the Cabinet Office is in large part formed from evidence that the science base has provided. For example, scientists at the UK Met Office and the Environment Agency, Public Health England and British Geological Survey have together developed advanced monitoring for natural hazards. Supported by other sources such as crowdsourced information, their analysis is provided to the Government agencies best-positioned to respond. Drawing on national and international analysis, it is possible to make some predictions about future patterns of disasters and highlight some areas where action can be taken to mitigate risks, both in this country and abroad. As the global population rises and cities expand, more people will become vulnerable to natural disasters. Many live on flood plains in developing countries. In Asia, this population is expected to triple by 2030. Climate change is likely to bring a greater frequency and intensity of extreme weather – such as more intense rainfall events – which will increase the risk of flooding, and more frequent extreme high temperature events. Rises in sea level, which expose coastal regions to the danger of storm surges, are also likely. Because disasters are episodic and localised, it is hard to evaluate their relative impact (Figure 1). Volcanoes generally cause few deaths, although a single eruption in Colombia in 1985 led to 20,000 fatalities. Similarly, the relatively low death toll from droughts in the past two decades contrasts with the high value for the 20 years previously. The key point is that many of these deaths are preventable. Human impact is not always reflected in death tolls. This includes injuries, outbreaks of infectious diseases, and damage to livelihoods and mental health. Longer-term and indirect effects include disruption of global trade, the creation of poverty traps by removing incentives to invest, and malnutrition. Disaster risks over the next three decades will change. Table 1 lists eight of the key drivers, along with the likely directions these changes will take and the associated uncertainties. By 2010, for the first time in history, more people were living in urban environments than in rural settings. Many mega-cities lie on flood plains, low-lying coastal areas or in earthquake zones. In developing countries, up to half of urban populations live in informal, overcrowded and unsanitary conditions which are particularly vulnerable to disasters, and the spread of infectious disease. Many countries have rising numbers of older people, often among the most vulnerable to disasters. Migrants too are vulnerable. Increases in intensity of livestock rearing and more genetically-uniform crops will encourage disease. Given that disaster risks will change, and we know many of the reasons for those likely changes, what can government and other organisations do to help handle these risks? Forecasting of some hazards, such as cyclones and volcanic eruptions, is becoming more reliable. Computer models of the climate system and the natural environment are getting better while satellite and other technologies allow more accurate and detailed monitoring. But some hazards still pose a challenge to forecasters. Drought forecasts depend on knowledge of the short- and medium-term climate system, local physical factors such as soil moisture, and economic and social drivers affecting water use. 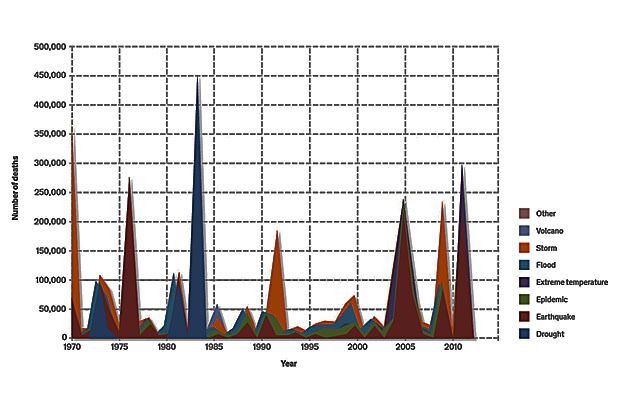 This complexity means that drought forecasting is still in its infancy. Nor is there any real prospect that earthquake prediction will become routine and reliable in the next three decades. The spread of infectious disease in animals and humans presents a different kind of challenge. In recent years, there has been better understanding of how humans and their livestock move locally and across borders. Scientists also have greater insights into the ways in which viruses are transmitted. For new viral strains such as SARS and H1N1 influenza, modelling remains challenging and human susceptibilities can be assessed only as the disease spreads. But epidemics whose spread is driven by environmental factors (such as cholera) can be increasingly forecast using remote-sensing data. Even if reliable forecasting is not yet possible, early-warning systems can greatly mitigate the effects of events such as floods and tsunamis. Bangladesh has substantially reduced the flood risks posed by cyclones. It has updated its warning systems, improved shelters and evacuation plans, and raised awareness. In Japan, Twitter messages have been automatically analysed to detect earthquakes. Much of the modelling for hazard forecasting is intensive and costly. It requires the best possible data, gathered consistently and over sustained periods. Some of the critical data and many of the models have to be global as they depend on measurements made in the atmosphere, oceans and on land. Linking these models to the needs of potentially affected communities requires a mix of expertise from very different disciplines and organisations. It is increasingly clear that data monitoring and resources need to be pooled – progressing work that the UK has started with government departments and science providers forecasting regularly on emergency natural events. In handling financial support for disaster relief, there needs to be better coordination between the public and private sectors. In construction and planning good design can promote resilience. Insurance companies already have sophisticated risk models that could open up new markets in developing countries where most assets lost in disasters are uninsured. Governments, agencies and communities face difficult choices. Both action and inaction have consequences. Investment against risks that fail to materialise can be counterproductive. There is always some threshold of ’acceptable‘ risk which depends on the nature and probability of the event, and on the priorities of those potentially affected. Even where the risks clearly justify investment, it can be difficult to get support for schemes far into the future. Investors in aid and development tend to focus on more immediate problems than potentially catastrophic events a long way off. Between 2000 and 2009 only one percent of overseas development aid was spent on disaster risk reduction. 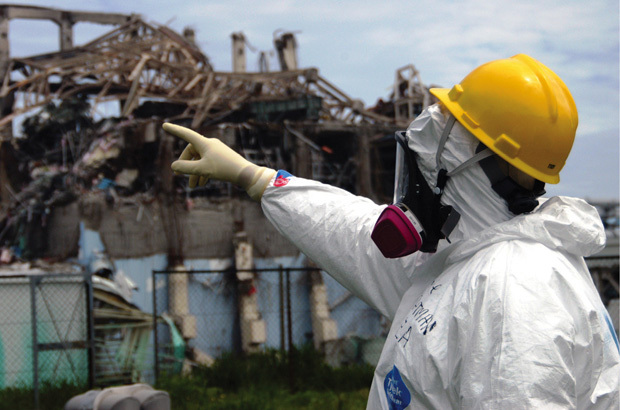 Risks from disasters cannot be avoided altogether. They can be transferred by improving insurance coverage and arranging for emergency funds, and reduced by with better early-warning systems and better urban design. However, for governments, the private sector and all those working to reduce the risk of disaster, the long-term economic case for resilience is compelling. When dealing with the immediate impact of a disaster, thinking about the longer term may feel like a luxury. But better management and rapid recovery depend on routine forecasting, and accessible results which improve both current and future decision-making. Many hazards cannot be wholly predicted or prevented, but we have the tools to do better. Thanks, I'd be interested to know a few more exmaples of effective disaster avoidance, you mention Bangladesh and Japan, are there other examples?